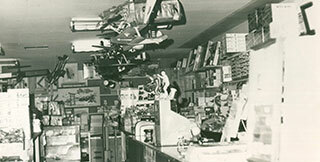 My father Frank B. Castiglione established Branford Hobbies in 1954. Born in 1923 prior to the great depression he later served honorably from 1942 to1945 with the 101st airborne during WWII. After working for the AC Gilbert Company best known for their “American Flyer trains” It was time to venture out on his own. The Gilbert Company had a warehouse on the hill in Branford, my father had fallen in love with the town and so the location had been found. For about one year the business was located in the center of Branford past the green close to what use to be the old post office. While getting a Valentines Day card for my mother, the owner commented, “You’re the kid who own the hobby shop? My father asked, “Do you know me? He said he was retiring and that this would be a perfect location. Well…with two thousand dollars borrowed from by grandfather pop purchased the property on the hill. 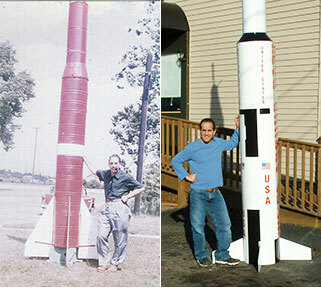 So his new location could be easily spotted dad erected a rocket on the front of the property. I’ve been told by many people dad would tell the kids he was “fixing it “ so he could send it back to the Army. Remember this was way before NASA. In the late 1969 my parents decided to diversify the property, into what we call “Summit Shopping Center”. 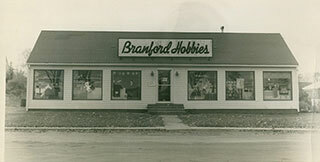 This is where we expanded not only the property but also Branford Hobbies. The original building was now spit into three separate rentals but also an additional two more were added the largest for Branford Hobbies. Construction was completed by 1970. In the 1970’s behind our shop a two-story office had been built partially on to our property. Unable to complete or sell the building and property was purchased by our family .The rest of front was rented and in 1979 we moved to our present location. I came into the business during the early 1980’s. He called it the changing of the guard . We worked side by side. In 1993 my best friend, my father lost his battle with cancer, he was 69…. By 2002 construction began again. This time expanding to our second floor. The beautiful high ceilings, glass railing has turned the store into a wonderful and interesting selling space. Memorabilia from the old stores and current products gives Branford Hobbies that real hobby shop feel.